A Painting December Interlude: Warlord Games Spartans. | Azazel's Bitz Box. A Painting December Interlude: Warlord Games Spartans. I haven’t posted anything new from the project in awhile. It’s because I’m honestly not enjoying painting Be’lakor or the giant at this point. Bel’s flesh-and-black look is tedious to paint, and the Giant’s clothing issues are once again completely off-putting. 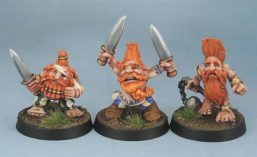 (They’re why he didn’t get painted 20-odd years ago). 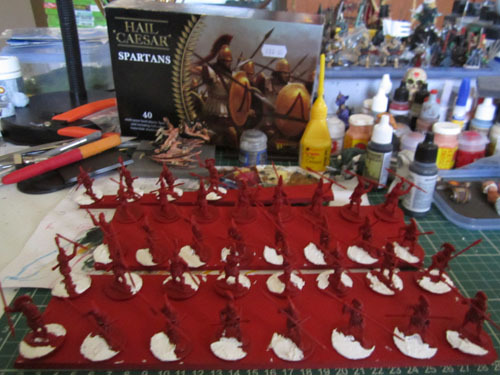 So I’ve mostly been playing videogames instead, and after watching a documentary with Marouda about Spartans, decided to harness her brief moment of enthusiasm and see if she wanted to work with me to assemble and paint up some Spartans together. We cracked open the Warlord box, and found that their rebadged Immortal Miniatures sprues are completely the same across all three of their Greek ranges – the only difference being a unique command sprue for each. Bell (bronze muscle) curiasses are rare in each box (one per sprue of 8), with the majority wearing Linothorax (linen armour) and two out of every 8 wearing only robes. The command sprues add one more Bell curiass and another robe-wearer. So – no units uniformly all wearing bell curiasses unless we wanted to loot all of them from the other Greek boxes with the result that they would then have none in their units.The Spartan box’s main distinguishing feature is a bunch of heads wearing the Pilos helm on the command sprue. So we had some decisions to make. 36 WIP Spartans. Not much to look at so far. In the end we went for a “idealised fantastic” selection for the Spartans. We both felt that while the pilos helm might be accurate for (late) Sparta, it’s ugly. So we went for a majority of corinthian-style helmets (worn earlier) which we’ll be pairing with shields bearing the lambda (worn later). We’re going with the Lambda to easily distinguish the Spartans from other Greeks and also the Macedonians that will be painted and assembled later. I know (from the research that I did while working out our options for these models) there are people over on TMP who’d happily tell me that I’m doing it wrong, a heathen and more besides, we’re going for models that look aesthetically pleasing (to us) that can also be distinguished easily as Spartans by ourselves and out friends. Rivet-counters be damned! The models took 3 days to assemble, and were sprayed last night with a Tamiya dark red. This morning I gave them a zenithal highlight of a brighter Army Painter red. Now I’m troweling acrylic putty onto the round Renedra bases to make their integral bases stand out a little less. In my researching, I found that the colour of the Linothorax worn by Spartans is debated, and may have possibly been red rather than buff/white so I think we’ll go with the red, along with their robes and skirts in red. These being historical figures of troopers rather than anything special, they’ll be getting “fast, tabletop” paintjobs – with the same mentality of “get them done” as my Moria Goblins or the plastic Gondor Rangers. Base coat, simple highlight and wash, then a matte spray basically. The aim is to look good as a unit on the table from a foot or two away rather than look good as individual models. Hopefully Marouda will keep her interest so we can get them finished inside a week – and then I can get back to this giant and daemon that have sapped my enthusiasm with a refreshed attitude. This entry was posted in Historical Gaming, Mythical Greek Army, Work in Progress and tagged Immortal Games Spartans, Warlord Games Spartans. Bookmark the permalink. Hate that feeling… hope you get some inspiration up soon mate!